You Sacrificing Nearly All of Your Recourses!" "Throw a Dream Wedding on a Shoestring Budget"
Thereâ€™s going to be a wedding! What a wonderfully, joyous time! But along with those happy feelings, comes a whole other set of emotions. a dream wedding looms ahead of you. Maybe youâ€™re reading this as the happy bride or groom. Perhaps you are the mother of the bride and need some tips on how to give your daughter the wedding sheâ€™s always dreamed of. It doesnâ€™t matter who you are, what matters is that youâ€™ve found us! Weâ€™ve Got The Answers Youâ€™re Looking For! arenâ€™t where you think they need to be in order to have that type of ceremony. Itâ€™s alright â€“ there are many people who are just like you. Thatâ€™s Exactly Why You Need This Book! With our amazing new book, â€œThrow a Dream Wedding on a Shoestring Budgetâ€, you can throw a Cinderella-type wedding without going deep into debt. Itâ€™s a special day and you want it to be everything youâ€™ve ever dreamed about. It can be! No matter how small your budget is, there are ways to maximize your budget and make it go farther than you ever thought it could. class neighborhood that they lived in for many, many years and raised two children in. It can be mind-boggling that some brides think itâ€™s alright to spend that much money on an event that lasts just one day! But for many, itâ€™s a cost theyâ€™re more than willing to incur. are that confident about this union. Thatâ€™s OK! dreamed of. Well, guess what? 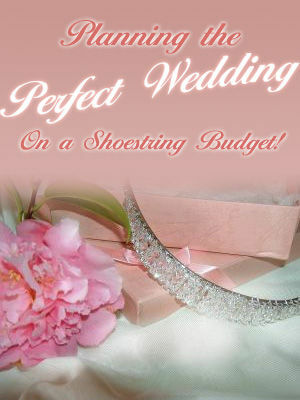 A great way to start is by ordering our valuable book, â€œThrow A Wedding on a Shoestring Budgetâ€ today! You could search for tips like these on your own, but why do that when itâ€™s all right here! Weâ€™ve done the work for you! Along with page after page of money saving tips, this book also gives you valuable checklists to keep track of expenses and make sure you have covered all aspects of throwing a wedding. Thereâ€™s nothing worse than being a week away from the wedding and stressing over whether or not youâ€™ve covered all your bases! Weâ€™ll Help You Do That! advice too, with this book. Need a little reassurance? Thatâ€™s alright â€“ we can give that to you too! How about a little word from a bride who read our book? You could hire a wedding planner to coordinate your wedding. But when you order this amazing book, you wonâ€™t have to. Theyâ€™ve Read our book and agree that itâ€™s definitely worth the $7.77! We are offering you this amazing and valuable guide to having the wedding of your dreams in an exclusive offer. If youâ€™ve always wanted a great wedding, itâ€™s well worth it to order our book for just $7.77. And just so you know that we are so confident you will not find a better wedding guide anywhere else, weâ€™re guaranteeing your order. 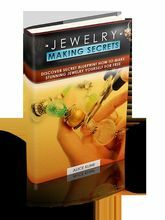 Not only do we know we have a product like no other, we know that this book will help you more than even you can imagine! the wedding expert. People will be coming to you for wedding advice. Think of how satisfying it will be to speak from not only knowledge, but from experience too! The time is ticking away. Be prepared for your special day! 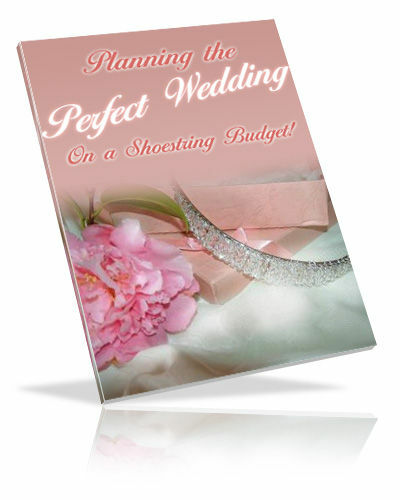 Order â€œThrow a Dream Wedding on a Shoestring Budgetâ€ today and save big on your big day! Congratulations and best wishes for a wonderful wedding and a happy marriage!